Really enjoyed the 10k apart from the hill at the start! Looking forward to the next one! First time running the Penicuik 10k and thoroughly enjoyed it. Every marshal gave out words of encouragement along the whole route. The weather was fantastic, the buffet superb & I even enjoyed the hill ! Thanks to the organisers and volunteers for a great event. I’m proud of Penicuik. I’m very proud that Penicuik Harriers put on such a special event – you made it so easy for all us amateurs to shine (you even turned the weather on) – if you’ll have me I’ll be back next year – thank you. That is so nice Justin! Penicuik is a place to be proud of and our running club too! Maybe we could get you to some training seessions or just running races as part of our club and enjoying being part of a team 🙂 You would be so welcome!!! Ran this for the first time yesterday and loved it, despite the hill! All the marshals were so friendly and encouraging and the scran afterwards was amazing! Bit disappointed at the lack of medal at the end, but understood why it had happened, great that you got so many runners. I will be back to do it again. Thanks for taking the time to comment here. I can’t apologise enough for the lack of medal, we were victims of our own success and I promise that it will not happen again. I am ordering 40 medals as soon as I have typed this 🙂 Hope to see you back. I remember my first 10K race and how tough it was ( and that was on a flat course ) and how good that first medal felt. Since then I have been running for quite a few years and been lucky enough to pick up a few prizes. However, the feeling I got when I saw your friend’s face when she got her well deserved medal was more satisfying than any of these. It made my day as well! Sometimes us so called ‘serious’ runners get obsessed with minutes and seconds and forget how lucky we are that so much effort and hard work has taken place to make an event like yesterday’s run so smoothly. We don’t always remember to say thanks to all the marshalls, timekeepers, results organisers, those who kept us supplied with tea and food. etc but we really do appreciate all of them. I hope you both ‘enjoyed’ your day and your friend recognises what an admirable achievement it is to run a 10k race after only 6 weeks of running. She definitely deserved her medal as much, if not more than the fast guys up the front of the pack. Well done, both of you and Well done to Penicuik Harriers for probably the friendliest and best organised club race on the calendar. Hope to see you next year. My first Penicuik 10km and it was great! So well organised and everyone really friendly. Thank you marshalls for encouraging me along the route. 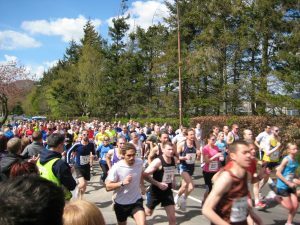 My 1st Penicuik 10k today 12th May 2018! And what a ??? ?day for it! A varied course with a good mix of hills & flat. Fantastically organised with super encouraging marshalls, a great to your club! Well done to all who ran it too! Brilliant race. Great hospitality too. Brilliant friendly race. Marshals so friendly and supportive. Food afterwards was superb. Thanks to all the organisers and helpers. Really friendly members and marshalls (one in particular. 😉 ). That hill at the start is gaining a reputation lol. Never ran in torrential rain and hailstones either lol.